Thinknet » Quora Answer: How can I ‘succinctly distill complicated concepts into pithy expressions’? Quora Answer: How can I ‘succinctly distill complicated concepts into pithy expressions’? Special Systems as Aliquot numbers are pithy. Not known for my pithy replies, I still have something to say on this subject. And that is that it is good to simplify as much as possible but not so much that what ever you are talking about is trivialized. Therefore the list of attributes of pithiness given in the first answer are not rules but depend on the circumstances. Let me say that I have found that one normally start with a complex mess when ever one starts to deal with any subject, but it is key to allow that complex mess to simplify itself rather than forcing it to simplify by analytically reducing it to the lowest common denominator. And what I have found is that this actually occurs, sometimes after long struggle and searching, and failure to simplify on ones own part. Let me give a good example which is my own Special Systems theory whose discovery is recounted in Autopoietic Reflexive Special Systems Theory at http://works.bepress.com/kent_palmer. That theory started out as an aside in my book The Fragmentation of Being and the Path beyond the Void. I was recounting the impact of the Primal Indo-European Scene on the advent of Western Philosophy among the Pre-socratics, and finally got to Plato. Since he has one book which is almost never read, i.e. the Laws, I decided to focus on that book in my commentary on how the Primal Scene was represented in Plato, and this led to a consideration of the relation between Aristophanes and Plato. In that work I discovered what I call the Negative Fourfold which is the opposite of the Positive Fourfold talked about by Heidegger, and taken from Socrates. The Negative Fourfold is a hidden metaphysical principle which reveals the dark side of the structure of the world and is in ancient Greece attributed to women. The negative fourfold appears in Aristophanes BIRDS and appears in his rework of the Theogony of Hesiod, in which there are four primal powers which are feminine which are Night, Chaos, Abyss, and Covering. It is interesting that covering is there, because for Heidegger Truth is discovered to be a process of uncovering. And this leads to the idea that the Positive Fourfold can be seen not just as Heaven/Earth//Mortals/Immortals but also as Light, Order, Grounding, and Uncovering (Aleithia). Once we understand the duality of the positive and negative fourfold we get a much clearer picture of the structure of the Western worldview as seen in Greek times at the beginning of the Metaphysical Era, while many are still within the Mythopoietic Era that ended with Thales. From these negative fourfold of sources of everything arises Eros, and from Eros arises the birds and after the birds come the Gods of Greece. This is then related to the five characteristics of Aphrodite, and it is discovered that the attributes of Aphrodite form an autopoietic ring, i.e. a self-organizing, self-producing ring. The appearance of Eros out of the four negative sources reminds us of the Egyptian Memphis creation myth in which there are four-pairs of primordial gods out of which the Atun/Atum/Atom (i.e. monad) arises. It is of interest that the arising of the monad leads to a swarm of birds, i.e. a swarm of monads (In the Egyptian Myth the primal scene is the alighting of a bird on some bit of land sticking out of the flooded Nile). With this in mind I started studying the Laws of Plato, and the commentaries I was reading on it compared it with the Republic/Ancient Athens, and Atlantis. I saw that this first Systems Theory, this first Social Theory, this first political theory, etc was organized in such a way that the emergent form was the polis in each case and that Plato was creating a caricature of cities. They all had very odd features. So I decided to study the three of them in detail and relate them to what I knew of Greek and Indo-European Myth. What i discovered is that the oddities of the Cities of Plato formed a pattern. For instance Atlantis is out at sea, the Republic/Ancient Athens is on the coast, and Magnesia of the Laws in inland sheltered from the sea. Also this is the order of increasing detail with which the cities are portrayed. I knew from J. Sallis in Being and Logos that the Republic was a journey to hell (Pyrus) and back, and Socrates was arrested on his way back from hell. So this meant that the fact that it is the only book read these days was to ignore the book where three elderly statesmen are paying a visit to the shelter of Zeus on the Isle of Crete. In other words we ignore the more detailed account of the positive journey which is the dual of the Republic. Now we get to the interesting part, I was sifting through all these mappings of the cities to each other, and to what I knew of the primal scene of the Indo-Europeans, and the primal scene of the Egyptians, when I decided to take another tact and look for similar structures in math. Almost immediately I found similar structures in several different types of math, and I started putting those together. Eventually I realized that the math could be used to organize the data I had about Plato’s cities and connect it to the theory of Autopoiesis which I saw in the mythology. At that point Special Systems Theory was born, and then I started following the math where ever it led me, and it has been a wonderful intellectual adventure looking for the precursors of Special Systems Theory, and the physical and mathematical analogies. What I found when I came back and applied that mathematical theory to Plato is that he got his view of the Special Systems from Egypt, because they appear in the Egyptian Gods, and when ever he is being obscure he is probably giving some oblique reference to the Special Systems. For instance the speeches in the Symposium correspond to the order of the Special Systems. By having the imaginary cities of Plato as an analogy, along with the Mathematical analogies and physical analogies, one can begin to apply the theory to lots of phenomena, that are anomalous and therefore understand some things that have always appeared mysterious to normal science, but have roots in arcane traditional sciences like Acupuncture for instance, which is a perfect model of an Autopoietic system projected on the human body rather than the body of the city (Polos). That means that there must be holes that are exactly equal to the sum of their parts, and it turns out that there are three such systems, which differ from each other only in their differing and deferring or DifferAnce (Derrida, what I call Hyper Being, identified by Plato, Heidegger and Merleau-Ponty) from each other, and also in their ultra-efficacy measured by hyper-effectivities and hyper-efficiencies born of their roots in negative entropy. Now in Mathematics we have in number theory numbers that are more than the sum of their parts and numbers less than the sum of their parts that correspond to the Emergent System, and the De-emergent Meta-system (OpenScape). But there are also aliquot numbers, i.e. perfect, amicable and sociable numbers, See http://djm.cc/amicable.html. These special and relatively rare numbers, especially the perfect numbers of which we know I believe 43 at the present time. Perfect numbers are those that are directly the sum of their divisors, i.e. the perfect sum of the numbers parts. Amicable numbers also known from antiquity, are numbers that sum to each other rather than themselves. See http://en.wikipedia.org/wiki/Amicable_number. Sociable numbers are a ring of numbers where each adds up to the next in a ring. Such rings can be of order 4 or 5, or 6, or 8,, or 9, or 28. See http://en.wikipedia.org/wiki/Sociable_number. Thus we can see how the negative fourfold can be a sociable ring, or the five attributes of Aphrodite. There is numerical support in the prime numbers for this anomaly, but also in other kinds of mathematics that is more complex. We can see these rings operating in Acupuncture Theory, and in hypercylcles discovered in biology See http://en.wikipedia.org/wiki/Hypercycle_(chemistry). For instance the Five Hsing in Acupuncture theory is a hypercycle. So after years of work, the big mess that was discovered in Plato’s cities eventually became something that can be stated very simply by its most basic mathematical analogy from number theory. But getting to this fairly pithy result was not an obvious thing from the beginning, and in fact many of the connections of math to the Special Systems were discovered by serendipity, after following many futile and dead end paths until they were exhausted. But the theory, slowly simplified itself as it was better understood. Plato said we want to cut the meat at its joints not through the bone. In other words we need to make our distinctions where nature suggests they should be made, not at some arbitrary place. So I would suggest that much of the complexity of expositions and the lack of pithiness comes from a lack of full understanding of the subject matter, but that is OK, because if we do not express what we know as we know it then we cannot refine it. It is the refinement that is the art, where you strip away ones own projections to see the phenomena itself in a new light that comes from itself and reveals itself in its essential form many times after years of searching and researching. After finishing my book on the structure of the Western Worldview called Fragmentation of Being and the Path Beyond the Void, I immediately wrote the research working papers in Reflexive Autopoietic Systems Theory, and then I summarized that in a monograph called Reflexive Autopoietic Dissipative Special Systems Theory. Each major retelling of this story usually comes with some kind of simplification that attempts to get closer to the quintessential characteristics of the Special System, and also the Emergent Meta-system which they compose along with the normal System to create an image of the Meta-system. These systems are mutually transforming, and they are the basis in my opinion of Consciousness, Life and the Social. But how we get to that conclusion is a long story. But the key to the whole set of Advanced Systems Schemas can be understood by this analogy to the Aliquot numbers, which all of us are capable of understanding once we appreciate the special nature of the Perfect Numbers. From there the theory goes on to study the analogies with more complex phenomena. But it only takes this one analogy to get across the central kernel of this meta-theory of the emergent levels that explain the oddities of things like Consciousness, Life and Sociality. So I hope this illustration from my own intellectual adventure proves helpful in getting my central point which is that Pithiness is something we have to seek hard to find in many cases, unless we impose it artificially on our subject. And if we take the advice of Plato we will put up with complex representations of what we know, so we can understand what we don’t know by the very messiness of our exposition. Sometimes as we work through that complex representation of our knowledge we find that it leads us to things we did not know we did not know, as with the Special Systems that were forgotten in our tradition but were part of the ancient wisdom of the Egyptians and Chinese that Plato who is central to our tradition tried to pass on to us, but it got lost along the way, and now that it has been rediscovered it can serve to solve a lot of otherwise perplexing subjects that appear to be in the blindspot in the eye of modern science. 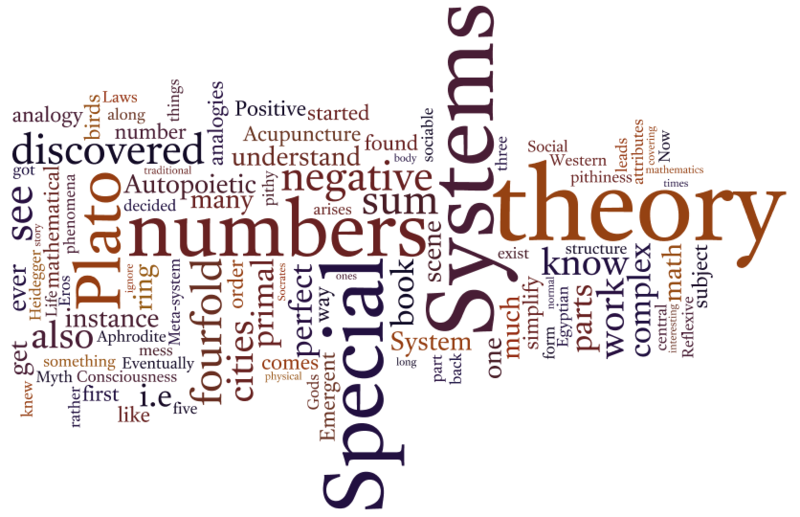 All this comes from asking seriously how it is that traditional sciences like Acupuncture work, but we cannot understand how they work, and when we understand special systems theory then we see that they work because they are based on the ultra-efficacy of Special System that lift the veil of entropy locally ever so slightly. But that is enough to allow all the variety of life on earth to exist, with at its height its social consciousness.